Harold Walter Wickstead was born on 14 November 1893 at Preston Plucknett, the son of navvy, later timber merchant's labourer, Lewis Wickstead (1858-1924) and Sarah Ann née Norman (1857-1927). He was baptised on 21 January 1894 at St James' church. Lewis and Sarah were to have seven children: Edith Mabel (1884-1956), Edwin (b1894), Harold, Frederick Charles (1897-1917), Mildred A (b1892), Ethel Florence (b1902), plus another child whose name is unknown who died in infancy. In the 1901 census the family were listed at Preston Plucknett, as they were in 1911 - at which time 17-year old Harold was employed as a 'Groom Gardener'. Within a couple of years Harold had moved to Tring, Hertfordshire, where he worked as a footman to a Mr Whitridge. Harold enlisted in the 4th Battalion, Grenadier Guards and his Service Number 24019 indicates that he enlisted during September 1915. The 4th Battalion had been formed at Marlow on 14 July 1915 and mobilised on 19 August 1915 when they landed in France to join the 4th Guards Brigade of 31st Division. Harold would have joined his battalion in France around January 1916. Although we cannot be certain exactly which battles Harold took part in, certainly his battalion was involved in the Battle of Flers-Courcelette - a battle, within the Somme Offensive, launched on 15 September 1916 with the battle continuing for a week. Flers–Courcelette began with the objective of cutting a hole in the German line by using massed artillery and infantry attacks. This hole would then be exploited with the use of cavalry. It was the third and final general offensive mounted by the British Army during the Battle of the Somme. By its conclusion on 22 September, the strategic objective of a breakthrough had not been achieved; however tactical gains were made in the capture of the villages of Courcelette, Martinpuich and Flers. In some places, the front lines were advanced by over 2,500 yards (2,300 m) by the Allied attacks. The battle is significant for the first use of the tank in warfare. Between 14 March and 5 April 1917 the 4th Battalion took part in the chase of the German Army as it retreated to the Hindenburg Line. During Somme fighting the Germans constructed a formidable new defensive system some miles in their rear. From February 1917 they began to withdraw into it, giving up ground but in carrying out “Operation Alberich” they made the ground as uninhabitable and difficult as possible. British patrols eventually detected the withdrawal and cautiously followed up and advanced, being brought to a standstill at the outer defences of the system. At the end of July the 4th Battalion, Grenadier Guards, took part in its next set-piece battle. The Battle of Pilckem Ridge, 31 July – 2 August 1917, was the opening attack of the Third Battle of Ypres. The British Fifth Army, Second Army and the French First Army on the northern flank, attacked the German 4th Army which defended the Western Front from Lille, to the Ypres Salient in Belgium and on to the North Sea coast. On 31 July, the Anglo-French armies captured Pilckem Ridge and areas either side. After several weeks of changeable weather, heavy rain fell during the afternoon of 31 July. British observers in the XIX Corps area in the centre, lost sight of the troops that had advanced to the main objective at the green line and three reserve brigades pressing on towards the red line. The weather changed, just as German regiments from specialist counter-attack Eingreif divisions counter-attacked. The reserve brigades were forced back through the green line to the black line, which the British artillery-observers could still see and the German counter-attack was stopped by massed artillery and small-arms fire. A substantial amount of ground was captured by the British and French. Following the Battle of Pilckem Ridge life for the 4th Battalion settled into the day-to-day struggle of trench warfare. On 17 September 1917 Private Harold Wickstead was killed in action by a German shell while in camp. He was aged 23. In its edition of 28 September 1917 the Western Gazette reported "Mr and Mrs Wickstead, of this village [Preston Plucknett], received the news on Saturday, that their second son, Private Harold Wickstead, of the Grenadier Guards, had been killed in action in France [sic], by a shell on September 17th. Private Wickstead, who is 23 years of age, was home on leave about five weeks ago. He had been in the Army about two years and had been in France about 21 months before having his leave. Before joining up, he was employed as footman to Mr Whitridge, of Tring, Herts. His funeral was attended by his brother, Sergt. Wickstead of the Artillery and his Commanding Officer and others. The following letter has been received from his Captain by the deceased's mother:- "Dear Mrs Wickstead, I write to offer you my deepest sympathy in your great loss. I feel it would be of great comfort to you in your grief to know that your son was killed instantaneously by a shell and could not possibly have suffered any pain. He was buried today with Lieut. Farquhar, of this Battalion, who was killed at the same time. His funeral was attended by his Commanding Officers and all his comrades, whom, I am sure, feel his loss most deeply. He had a lot of friends, and I knew your son personally for the last 17 months, being in the same Company. I always admired him as a gallant soldier and an upright man, and I shall miss him more than I can say. My orderly took most of his little kit over to your other son in the Artillery, who is near here. The remainder will be sent to you through the usual official channel, as also will the location of your son's grave, which unfortunately I am debarred from giving you now. Let me please express once again my deep sympathy." Another letter received from his Chaplain, reads as follows "It is with the greatest regret that I write to you to tell you of the death of your son, Private H Wickstead of the Grenadier Guards. He was killed by a shell in camp on the 17th September, quite instantaneously, so that he did not suffer any pain. Your son was buried in a Military Cemetery. A cross with his name and regiment has been erected to his memory, and a service was held at the burial, attended by the Commanding Officer and many officers and men." 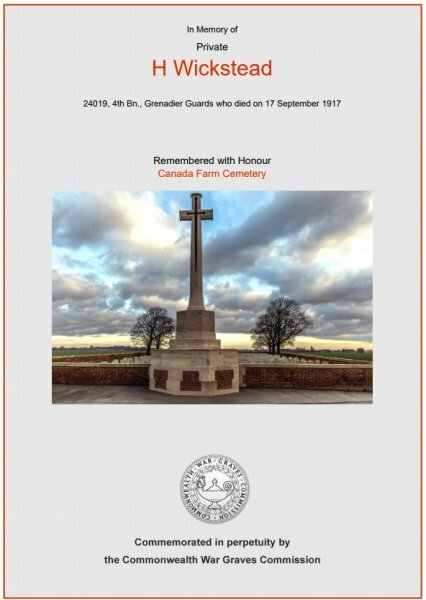 Harold Wickstead was interred in Canada Farm Cemetery, West-Vlaanderen, Belgium, Grave III.C.2.and his name is inscribed on the Preston Plucknett War Memorial. The Commonwealth War Graves Commission certificate in memory of Harold Wickstead. 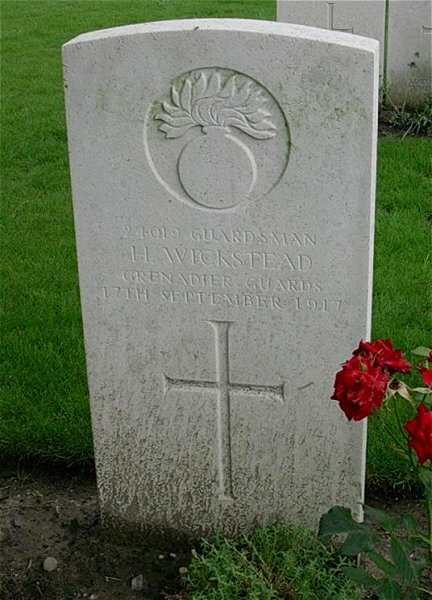 Harold Wickstead's Commonwealth War Graves Commission's headstone.